Since retail clinics started gaining popularity in 2007, healthcare professionals have been worried — for all sorts of reasons. Will patients still get the care they need? Will they visit their doctors less? How will these clinics impact patient volume in nearby emergency departments? First, a brief history and explanation: Retail clinics are the in-store kiosks often found in Walgreens, Target, CVS, and Wal-Mart. For the most part, they handle simple acute conditions and preventative care (sore throats, colds, immunizations, and screen blood tests). They’ve been around since the early 2000’s, and we now have over 1,500 of them nationwide (though they’re mostly in the South and Midwest). 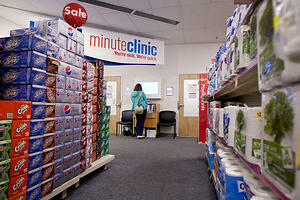 Retail clinics offer extended evening and weekend hours, making convenience their number-one attribute. They’re staffed by nurse practitioners, who can write prescriptions and offer care for certain conditions. You don’t need to think too hard or for too long to find the great benefit these clinics can have. Anyone who’s ever had an injury, illness, or infection crop up on a Friday night would happily go to receive the care/prescription/reassurance that whatever you have isn’t serious instead of suffering through until Monday or spending hours (and hundreds of dollars) in an emergency department. The concern we’ve heard most recently came from hospital administrators worried about the impact of retail clinics on their emergency departments. So Opera Solutions conducted a study to measure this impact. In short, it’s good news for hospitals: the opening of nearby (within a 30-mile radius) clinics had no measurable impact on patient volume at the hospitals in our study. We encourage you to read the study if you’d like more information on how it was conducted, where these hospitals were located, and exactly what we saw.